Good visual commercial for not relying upon older generation fighters though. Would be a shame for Pakistani F-16's to be going up against HAL Tejas. Let's hope that pretty big fleet of SU-30s comes in handy. Gutsy going into combat today in that flying museum piece. Was it shot down by fighters or ADA? ... Pakistan's military spokesman said that Pakistan fighter jets had carried out "strikes" - exactly what they did remains unclear - in Indian-administered Kashmir on Wednesday. Two Indian air force jets then responded, crossing the de facto border that divides Kashmir. "Our jets were ready and we shot both of them down," Maj Gen Asif Ghafoor said. He said that one Indian pilot was in the custody of the Pakistani army. Officials had previously said two pilots had been captured and one had been taken to hospital. Beijing has refused to confirm a former Pakistani air force officer’s claim that China-made JF-17 fighters were used by the Pakistan Air Force to shoot down Indian military aircraft. Less than two hours after the claim was made on Wednesday morning, the share price of the state-owned plane maker’s sister company rose in trading in Shenzhen. The Chinese defence ministry did not respond on Thursday when asked whether JF-17s were involved in the Pakistan-India clashes. The Pakistan Air Force (PAF) had said on Wednesday that it shot down two Indian fighter jets that entered Pakistani airspace near the Kashmir Line of Control, and captured a pilot. India said that its air force lost only one MiG-21 Bison and pilot while shooting down a Pakistani F-16. More on the JF-17 here (PAK Aeronautical Complex Karma), here (archived Chengdu Aircraft Industry Corporation page, in Chinese) and here (Wikipedia - usual caveats apply). WAGAH, Pakistan -- Pakistani officials brought a captured Indian pilot to a border crossing with India for handover on Friday, a "gesture of peace" promised by Pakistani Prime Minister Imran Khan amid a dramatic escalation with the country's archrival over the disputed region of Kashmir. good on Pakistan for doing that, hopefully this gesture is remembered when India is in the same position. Hi guys, I'm just looking for some independent/neutral opinions on this certain piece from the Kashmir conflict, since both medias are inflating some news with bias and misreporting some events. 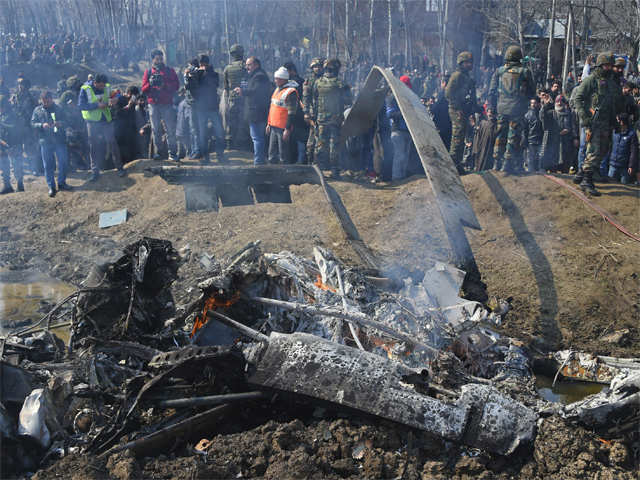 An Indian Air Force (IAF) Mi17 helicopter crashed some 200km inside Indian Kashmir, around the same time Indian officials say that Pakistan Air Force (PAF) conducted strikes inside India. IAF says the helicopter crashed due to technical faults. But rumors on the Pakistani side claim that the heli was shot down either by PAF in an air-to-air kill or by a rebel manpad. Just wondering what you guys make of this? Next to no coverage of this outside "backyard" media, especially given the bigger events in the area -- Janes had a brief up for a while (screen capture attached - link is to a Google Cache version while it lasts), but it seems to be no longer posted. Meanwhile, bellingcat (OSINT folks) looks over the open source imagery to assess the odds of an F-16 having been shot down, as a few on social media claim, rather than a Mig-21. Summary: "... there’s no compelling evidence offered as of yet that an F-16 would have been shot down, and all signs point to MiG-21 wreckage having been on display thus far." I was asking specifically about "the hole" in the wreckage. Other Indian media sources say 6 IAF personnel on board all dead. 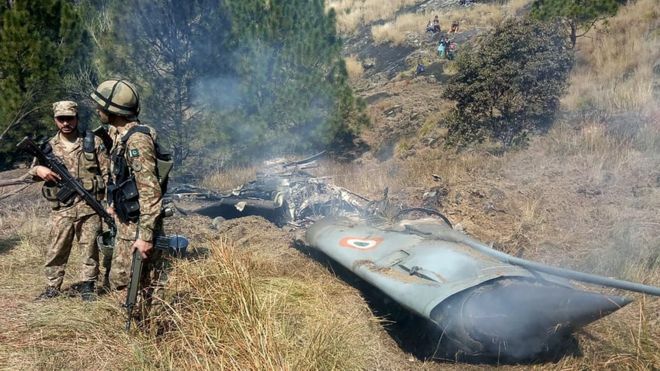 Originally, it was reported as another Mig-21 crash (this is in Indian Kashmir, separate from the crash in Pakistani Kashmir), but you can clearly see the rotor blades of the heli in the wreckage. IIRC most (but not all) Manpads missiles use impact/proximity fuses. So, if a Manpads missile brought it down you would probably wouldn't see one big hole, but several smaller holes caused by warhead fragmentation. The first picture doesn’t look like the same area surrounding the video and other photos, so hard to confirm if the apparent puncture on the tail boom is the same event. While the puncture looks significant, it clears the upper portion of the tail boom that contains the tail rotor shaft and the boom is otherwise intact longitudinally, so it could also be a blunt puncture by an object on the ground. Even if it was an un-fused munition (RPG, etc.) it would have appeared to pass straight through the boom, missing the tail shaft and tail rotor pitch controls. The report mentions poor weather, which is either: a) true and thus unrelated to the PAF, or b: untrue/unrelated and caused by something other than a PAF aircraft shooting something through the relatively narrow structure of the tail boom with a weapon that passed through the boom kinetically (vice explosively). Like others, I’d expect to see a lot more fragmentary warhead damage if something hit the helicopter.